A researcher deep underground in the Twins Cave. Researchers say Twins Cave may have been site of pagan ritual that lighted the way to Hades' realm. We often hear about how Jerusalem is holy to followers of the three major monotheistic religions. But what is less well-known is that the surrounding Judean hills were home to pagan ritual sites involving Greco-Roman gods. One such site, linked to the harvest goddess Demeter, has been identified at the Twins Cave, according to a study released by the Yad Ben-Zvi historical research institute last week. In Greek mythology, Demeter's daughter, Persephone, was kidnapped by Hades, king of the underworld. After Zeus intervened, Hades agreed to send Persephone back aboveground - but first he convinced her to taste the seeds of the pomegranate, an underworld fruit. Once she tried them, she could not remain completely cut off from Hades' realm, to which she had to return for three months every year. And how do you reach the underworld? In Greco-Roman thought, dark, deep pits or caves were considered gateways to hell and were often used for rituals dedicated to pagan gods, say Boaz Zissu, who teaches classical archaeology at Bar-Ilan University, and Eitan Klein, one of Zissu's graduate students. Zissu and Klein said in the study that the Twins Cave was used for just such pagan rituals between the second and fourth century C.E. The 42 clay lamps from the late Roman period discovered in the cave were used as part of a pagan rite, apparently meant to guide Demeter's way as she searched underground for her daughter, they said. Similar lamps and torches were used in celebrations dedicated to Demeter in ancient Greece, and the theory is in keeping with contemporary depictions of ceremonies dedicated to Demeter that have been found in Acre, Beit She'an, Nablus and Caesarea. Zissu and Klein said the theory was strengthened by the fact that most of the lamps had not been used to give light and, to judge in part by the difficulty in accessing them, were not meant to have a practical purpose. 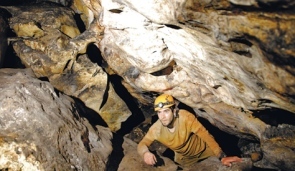 The researchers began studying the cave in 2009, as part of a broad survey of the area conducted with Amos Frumkin, head of the Israel Cave Research Center. They discovered evidence that the cave had served as refuge during the time of the Bar Kochba Revolt. A large trove of silver coins of the period was found on the site. In the course of further study, Zissu and Klein discovered the clay lamps near a vertical shaft that descended to a depth of 21 meters. So what do twins have to do with it? The researchers also said an Arab tradition connected with the cave hints at its connection to the pagan rites. The Arabic name for the cave is "Umm a Toamin" (Mother of Twins ) because, according to local legend, a sterile woman who drank water dripping from the roof of the cave became fertile and gave birth to twins. This story gives rise to the theory that yet another rite was carried out in the cave, one related to the twin brothers known as the Dioscuri. Castor and Pollux were both sons of Leda, who in Greek mythology was the daughter of the Aetolian king Thestius, but Castor had a human father while Pollux was the son of Zeus. In a quarrel with their cousins, Castor was killed, but Pollux was not willing to part from his twin and asked to share his immortality with him. Like Persephone, they too wander between the underworld and life on Earth. And their portal may just be a cave in the Judean hills.